“Real” experts’ on climate change? Really? This poster presents clear and undeniable evidence that the debate is not over. 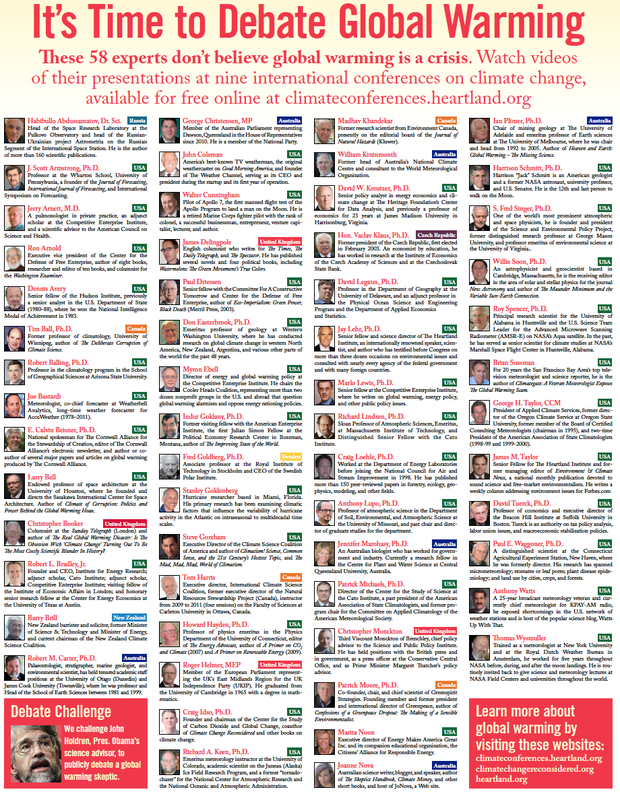 Looking out from this poster are 58 real experts on the causes and consequences of climate change. Each of them refutes the existence of a “consensus of scientists” on the size of the human impact on climate, or whether it merits immediate action. Many of these experts say the threat is grossly exaggerated, often to advance a political agenda. So they have raked up 58 “experts” – and how do they define “real experts? Apparently their criteria is that they have spoken at one of the Heartland Institute’s climate denial conferences! Journalists like James Delingpole and Christopher Booker. 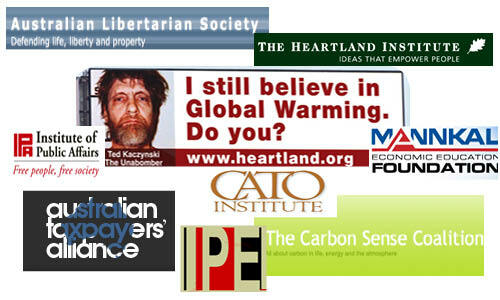 Climate denial activists like Barry Brill, Christopher Monkton, Steve Gorham, Tom Harris and Joanne Nova. Right wing “think tank” executives and fellows like Robert J. Bradley Jr., E. Calvin Betsner, Dennis Avery,Ron Arnold, Paul Driessen, Myron Ebell, Indur Golklany, David W. Greutzer, Marlo Lewis, Marita Noon and James, M. Taylor. Politicians like Vaclav Klaus, George Christenen and Roger Helmer. There are also a few meteorologists (mainly weather forecasters), astronauts and economists. Followers of the climate change debate will also be familiar with the remaining few on these who do have academic qualifications in relevant fields – and maybe some publications. They are the usual contrarians and mavericks who seem to bast in the glory of the promotion they get from climate change deniers. “Real expert” – come off it. No one will be surprised at the headline on Dana Nuccitelli‘s Guardian blog – Fox News found to be a major driving force behind global warming denial. Still, the article references a new research paper by Hmielkowski et al. 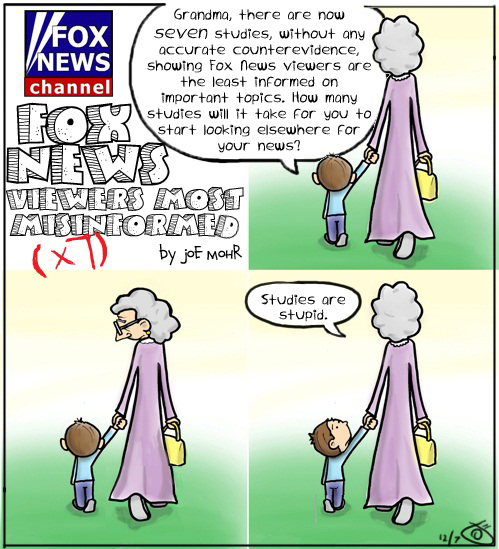 in the Public Understanding of Science (see An attack on science? Media use, trust in scientists, and perceptions of global warming). The conclusions from this research affirms we are right not to be surprised, but also shows links between climate change denial and trust in science and scientists. They also conclude that the news media people read can influence both their attitude towards climate change issues and their trust in science and scientists. I find this last point disturbing. It’s one thing for a group of people to disagree with current scientific findings, but far more serious if they are motivated to disagree by lack of trust in scientists. That does create a defense mechanism for the protection of beliefs against the evidence of reality. Further disturbing is the implication that such distrust is actively promoted by some conservative media. It is probably not surprising that trust, or lack of trust, are cognitive mechanisms enabling people to draw conclusions without the need for intensive analysis of the evidence. consequently people are effectively programmed, by the nature of their normal news media reading, to draw politically motivated conclusions, whatever the evidence. “Scientists could remain on the sidelines and exclusively produce research for peer-reviewed journals and reports. Although this strategy may help keep scientists above the fray, this does not mean that they will remain neutral actors in the eyes of the public. Indeed, climate contrarians and conservative media outlets are already attacking the credibility of climate science and individual scientists. Remaining uninvolved gives climate contrarians and conservative media free rein to redefine how the public thinks about climate scientists and their research. Alternatively, scientists could use their trusted position in society to engage the public by providing them with understandable analysis and information about the causes, risks and potential solutions to climate change. However, this proactive stance may lead some members of the public to view scientists as increasingly politicized. In both scenarios, some members of the public may lose trust in scientists, which may be difficult to regain . Importantly, however, the sidelines strategy will likely lead to a greater total loss of public trust than the public engagement strategy – especially among the Cautious, Disengaged, and Doubtful audiences identified in prior research, if climate contrarians are allowed to shape public discourse uncontested. Regardless, scientists will play an important role in how different publics perceive the issue of global warming. The question is whether it is on their terms or the terms of climate contrarians and their allies.” My emphasis. I reviewed this book recently, but its worth repeating. It’s fictional, but it’s about an important issue – climate change. Price US$4.99 (Kindle); NZ$6.00 (Epub). They are quick to accuse scientists of alarmism but I have always maintained that those who are most actively denying climate change are the real alarmists. It’s just that their motivations are political – and their political beliefs alarmist (see Alarmist con). This short video illustrates this for the case of Christopher Monckton – an idol of the militant climate change denial movement. The Terrifying World From Monckton’s Mind – YouTube. Meanwhile, the remaining militant climate change denialists in New Zealand are eagerly awaiting the next local visit from Christopher Monckton. It starts (appropriately) on April 1st. I understand some of the local media people are also vying for the opportunity to interview the guy. Last time his visit produced some rather entertaining videos. As you can see from the video above, he is good for a laugh. Who are these “credible experts”? There is a nice article over at A Few Things Ill Considered about climate change denial. And I thank Grant, from the Code for Life blog, for bringing it to my attention. Climate Trolls – An Illustrated Bestiary produces an illustrated list of the different types of personality among climate change denial activists, and the websites or blogs they tend to congregate around. There is ,The Galileo Gambiter, The Auditor, The Sanctity of Science concern troll, The Faux Skeptic, The Uncertainty Monster monster, The Avenger, The Gish Galloper, Hockey Goon, The Conspiracy Theorist, The Right Wing Ideologue and Breakthrough Boys. Each with photos illustrating how they see themselves, and how the public see them. It’s quite an entertaining read. This one – The Not the IPCCer – struck close to home. It seems to describe the group that gathers around the NZ denier blog sites Climate Conversation Group. 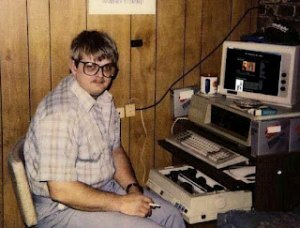 And the picture of “How the world sees them” coincides with my image of people who find it impossible to get a life and instead spend all their time attached top their computer passing on links to anything they can interpret to fit their world view. The Not the IPCCer – whatever was said on whatever topic by any of the IPCC reports, the opposite must be true. Indeed there has never been a single correct statement made or paper published by any member of mainstream climate science. This conviction extends to even the most non-controversial and well supported contentions found in the literature and is accompanied by complete ignorance of what is found in the literature. Special attack: Peer review really means “Pal review” and Michael Mann and Phil Jones control all the major journals and all the world’s science institutions. Favorite Topic: Whatever the latest typo found in the latest IPCC report is. Best counter: Light. The copious self-contradictions permeating their minds thrives only in darkness. These local activists have been very vocal (at their own watering hole, anyway) since their defeat in the recent high court action they took against NIWA scientists. They have resorted to everything to justify their stance, avoid paying the NIWA costs awarded by the courts and claim the real climate expertise rests with them, rather than New Zealand’s climate scientists. Currently one of the most central figures in this little band is Manfred Otto Dedekind (See Shy climate denier in “science team” reveals himself for details). Manfred (who goes by the alias Bob D) on the internet was the “anonymous science team” behind the infamous attack on NZ scientists “Are we getting warmer yet?” The document which claimed that the evidence showed that no adjustments of NZ temperature data was necessary to accommodate site changes and that NIWA used such adjustments to invent an increase in temperatures. He then did an about turn (without acknowledging that huge error) by agreeing that adjustments are necessary, doing his own manipulations of the data and telling NIWA his adjustments were the only correct ones. That NIWA had purposely got it all wrong. He and his mates used his “analysis” as their evidence in the High Court case (see High Court ruled on integrity – not science). Quite rightly, the court refused to accept that he was the climate expert he claimed to be (he has no publications at all in the area, 4 [very old] scientific publications in total – only two of which he is the senior author. I can see why his group initially wished to keep him anonymous). But this hasn’t stopped these characters from getting behind Manfred and promoting him as an Über climate expert. One of their sister denier blogs Tallbloke’s Talkshop describes Manfred as an “expert” and a “statistician!” (see How NIWA added lots of warming in New Zealand – and got away with it – so far). And Watts Up With That, a prominent denial blog, is describing him as a credible expert! These guys live in a world of their own. No wonder they find trouble in getting a life. I argued that, in fact, these groups have for several years have accused NIWA scientists of fraud, even if the specific F word had not been used. It is disingenuous of these people to now claim “We never said it was fraud” and limit themselves to the literal words used in the High Court submissions. Come on Richard – enough of the porkies. You are just relying on reader’s ignorance of the statement. (While at the same time avoiding the long history of aggressive accusations of scientific fraud your organisations have made against NIWA scientists). 20. In making the 1999 decision NIWA was influenced by the expectation that significant NZTR warming would encourage funding for additional climate change research. If this isn’t accusing us of fraud, I don’t know what is. (b) The avoidance of political embarrassment, or reduction in public confidence in NIWA’s scientific advice on climate matters, which might arise if the NZT7 failed to align with the warming trend shown in the 7SS. Again, this is surely accusing us of fraud, by any other name. The explicit use of the ‘F’ word is not necessary. Given the long history of the unfounded attacks by Treadgold and his mates on NIWA’s scientists, that again and again their claims have been exposed as unfounded and NIWA’s position vindicated, and now finally the rejection of these denier claims by the High Court, let me repeat my suggest from 2 years ago in Painted into a corner? 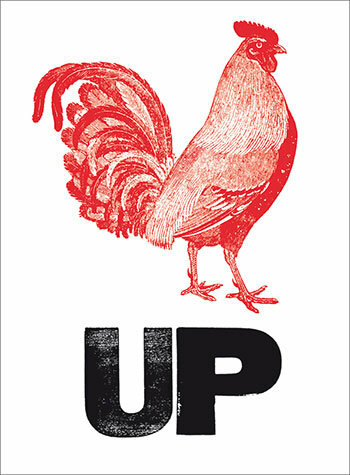 Isn’t it long past the time that Treadgold and his mates “man up”, apologise and withdraw their claims? Some readers may be unaware that New Zealand SciBlogs produces a weekly podcast (usually available Friday afternoon). It’s worth listening to as it provides a Kiwi angle on current science news. The latest podcast (Episode 37 – Science on trial) will interest everyone concerned about climate change, and particularly the recent High court case taken by a climate change denial group against NIWA. 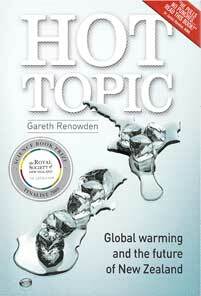 There is a long interview with Gareth Renowden, a SciBlogger who writes for Hot Topic. Gareth has published a book on climate change (Hot Topic) and is a mine of information on the science and politics of the issue. He provides an in-depth analysis of the High Court case and the people behind it. Well worth catching up with. Also on this last podcast is an interview with James Renwick, a climate scientist working at School of Geography, Environment and Earth Sciences, Victoria University. He comments on the current scientific and political situation regarding climate change. And if you have the time why not go back and listen to previous SciBlogs podcasts. For instance Episode 34: Digital Earth 2.0 includes an interview with yours truly discussing my blog post on the changing face of Australia’s religious affiliations. We have plenty of debates in science – and sometimes these can become heated. But they are important to the whole enterprise. Ideas and theories must be tested against reality, and that testing should be done collectively – individuals are too prone to bias. So argument, debate and testing against reality is what keeps us honest. But of course that debate must be carried out in “good faith.” With the intention of exposing errors and coming to a resolution which provides a better picture of reality. From my perspective scepticism is part of the process and there is plenty of room for sceptics in science – including climate science. Honest, good faith, scepticism can only be good. So what about “deniers.” Well, the difference here is that their “scepticism” is not aimed at improving our knowledge, or of furthering truth, but in discrediting that knowledge. By now we have all become used to the climate change denial activity, its sneering attitude towards science and the facts, and the support it gets from the fossil fuel industry and extreme right-wing and conservative politicians. But here’s a little guide I came across which helps illustration the difference between scepticism and denial. It’s from Get Energy Smart! NOW! 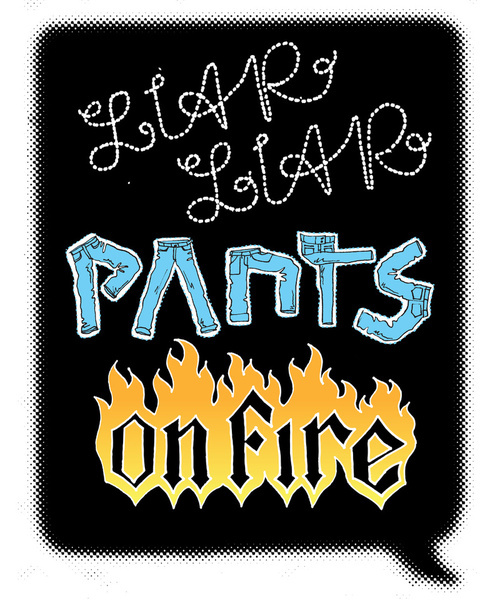 and the post is titled “Liar, Liar, Pants on Fire …” Differentiating Skeptic from Denier. (I sort of think the childishness of the title is appropriate in this case). I look forward to the High Court verdict. *This denier group is rather weird. It calls itself the “New Zealand Climate Science Education Trust,” and is known as a branch of the NZ Climate Science Coalition – a local denier group with links to the US Heartland Institute and other right-wing think tanks. It originally attempted to register as a charity and was actually listed for a short time in the NZ Charities register. Now it has been removed! Perhaps their registration was rejected, possibly because of its political nature or its unwillingness to provide financial reports. Or perhaps they decided that there was little mileage (and little support) from going down the charity road and it has fallen back on deeper financial pockets. Here’s a short but informative discussion between Naomi Oreskes and Australian politician Nick Minchin. He is known for his denial of human inputs to climate change and for attacking the science. Oreskes suggests to him that his reasons for denial are not scientific. That he should accept the science and get on a deal with the political and financial issues which really motivate him. This is an extract from the documentary “I Can Change Your Mind About..Climate.” You an watch the film on line. In short, learning about the (supposed) high cost of the solution is what turned him from a believer in climate science to a denier. This is something which I seem to have to learn again and again in my debates with those attacking the science of climate change and climate scientists. Although they attack the science their real motivating beliefs are political and financial. It’s an interesting psychological phenomenon, and an unpleasant political one seeing they are needlessly badmouthing innocent and honest scientists. Naomi Oreskes has often lectured and written on science denial. Her book Merchants of Doubt: How a Handful of Scientists Obscured the Truth on Issues from Tobacco Smoke to Global Warming is well worth reading. Thanks to: Deniers in Denial about Why they Deny. See also: Q&A Climate Debate the ABC programme screened after the above documentary.